Since I added a passive programming station for my school age kids, I decided to update my preschool area. My toddler table was the bane of my existence for a while. I could never quite figure out what to do in the preschool area. I have a small children’s room and offer puzzles, board book bins, and assorted toys for children to play with. I had a basket of coloring pages and crayons. I tried all different kinds of options: coloring pages, activity pages, blank pages to be more creative. It just didn’t work. Children would half-color a page and leave it littering the children’s room. I was wasting money on paper and staff time to photocopy pages, and more staff time to clean up. So…I decided to try something new. I covered it in felt! First I used a sky blue. 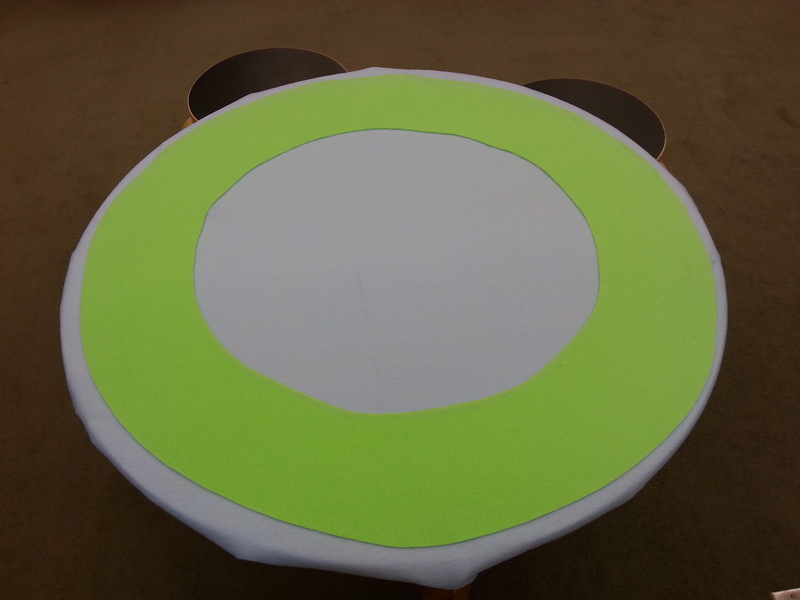 I used Velcro tabs along the bottom of the table to hold it in place. 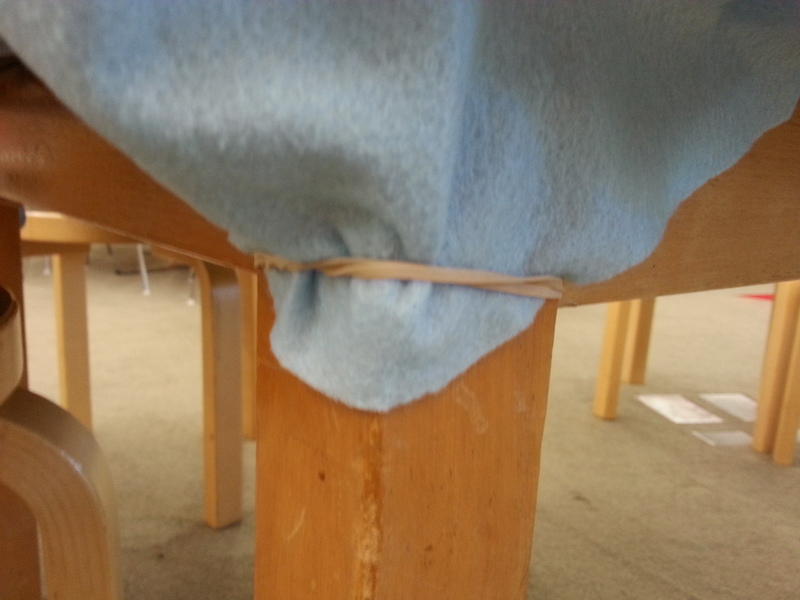 I also used rubber bands on each leg to secure it. 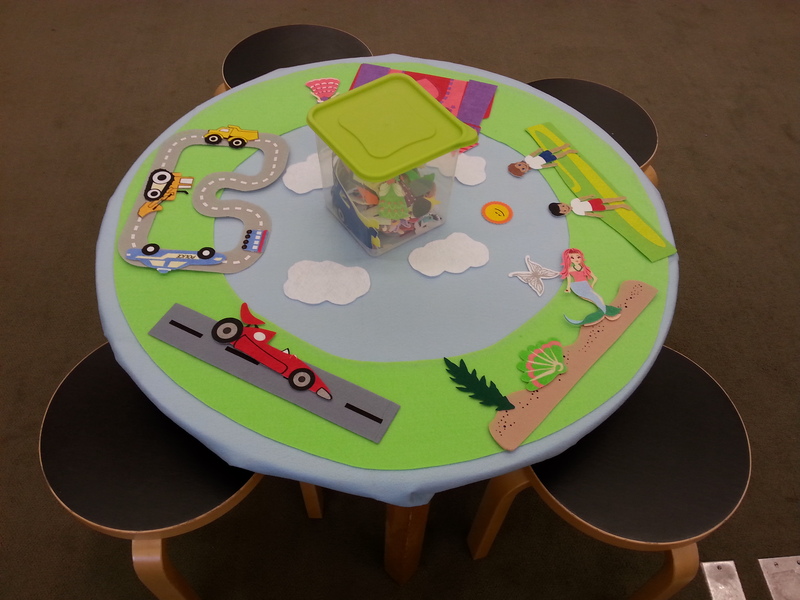 I placed different felt pieces in a Tupperware bin: mermaids, cars, princesses, fairies, construction vehicles. It’s been a HUGE hit! Not only do the children fit around the table better (most times they stand around the table, so they fit more kids than 4 chairs), but they love playing at the library and don’t want to leave. It’s also a great way to let the flannel stories that haven’t worked well in storytime live on! Great idea! 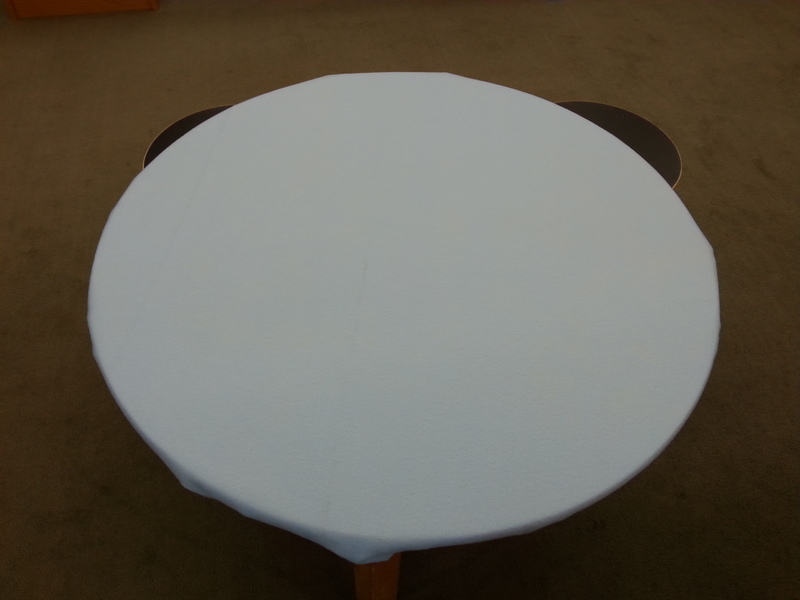 Out of curiosity, do you find felt pieces all around the library, or are they pretty well contained? Actually since they stick to the table they seem to stay there. Much cleaner than coloring pages and crayons all over! We just put this out two weeks ago and I have a tupperware bin with all the felt pieces inside. It says, ” After your done with your adventures, please place our felt friends back in this bin.” They are always put away. Always. It’s amazing. I’m going to use that! Thanks for letting me know. What an awesome idea! Much more inexpensive than a train or lego table, and it can be changed out easily too. Thanks for sharing! Thanks! Yes really cheap and easy. I’ll be posting my fall one in a couple of weeks. I copied your idea and it has done wonders for our toddler area. Instead of pulling picture books off shelves and ripping pages out of boredom, our littles have something creative and constructive to play with. Thank you so much for sharing your idea. What is the height of your table… I’m gearing up to start mine this fall! 27″. If you search for “toddler table” you’ll find choices!! Have fun. 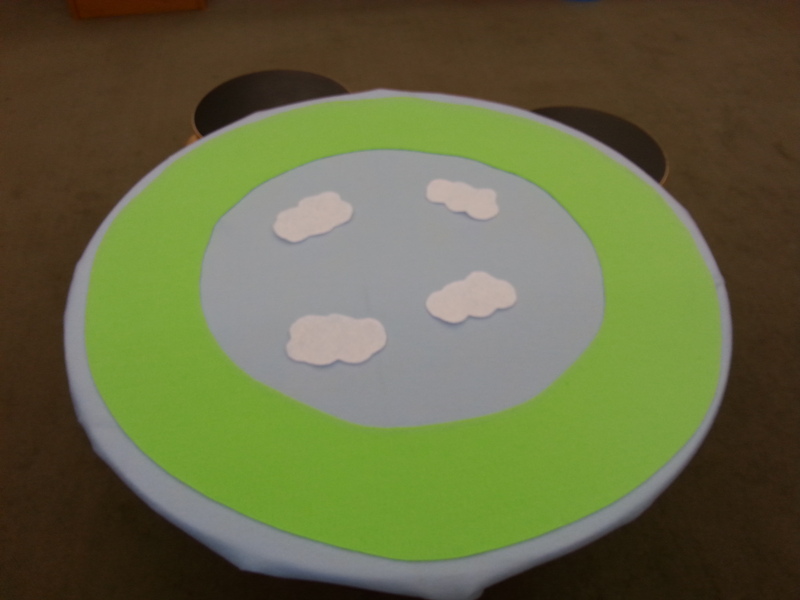 This entry was posted on July 11, 2014 by mrsshaia in Felt Table, Flannel Stories, Passive Programming and tagged Felt table, Flannel Stories, Passive programming.